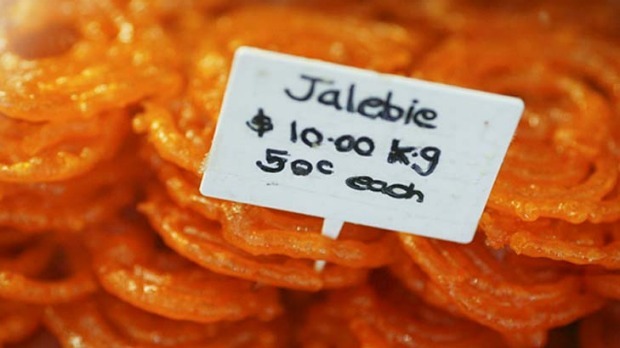 Hot and spicy ... golden-fried sweet jalebi. Sue Wallace samples the authentic fashion and flavours of India without leaving the city. Aqua and orange saris flap in the breeze, Bollywood music is blaring and the aroma of pungent spices fills the air. If I close my eyes I could be wandering along the back streets of a small town in India - but I'm in downtown Dandenong, home to more than 4000 Indian families. The Little India precinct in Foster Street is a great place to experience the tastes, smells and sounds of India without leaving the country. Here you can buy everything from a Maharajah's suit to the latest Bollywood CDs and videos from speciality fashion and grocery shops. I am doing a Masala Meander tour with guide Himanshi Munshaw-Luhar, who grew up in Mumbai and moved to Australia in 2005. Her aim is to provide a greater understanding of the culture and history of Indian food and encourage those who love the cuisine to be more adventurous than just ordering chicken tikka masala or beef vindaloo. Munshaw-Luhar sets us straight right from the start. "Everything in India is about food," she says. "And the dialogue and food changes every 50 kilometres in India, so there's plenty of different tastes as well as more than 1000 dialects." Our first stop is morning tea at Amritsari Sweets, a cafe that specialises in northern Indian cuisine, which she says is often deep-fried and heavier than southern Indian food, which is lighter, steamed and quick to eat. We start with a tasty samosa channa, a pastry stuffed with flavoured potatoes and channa made from chickpeas with gravy. We finish our snack with a masala chai then head to an Indian supermarket . We wander up and down the crowded aisles discovering bags and boxes offering everything from lentils to pappadams. "People come from all over Melbourne to get their supplies at these shops, where you can buy everything from Indian cosmetics to the popular spices," Munshaw-Luhar says. She passes around different spices to smell, including cardamom, turmeric, chilli, cinnamon, mustard seeds and cumin. "Indians wouldn't think of cooking without spices, it's such an integral part of our cuisine," she says. Next, Indian fashion comes under the spotlight as we head into several shops with rows of saris in brilliant colours. "Try one on," says the owner and I am draped in a hot-pink sari with intricate beading and even find myself slipping on some jewelled shoes. Munshaw-Luhar says the shops also stock sherwani suits and kurta pyjamas for men and expensive wedding outfits. They also do a great trade for Bollywood parties. I leave with the hot-pink sari, sparkly shoes and a handful of colourful bangles, secretly planning my own Bollywood extravaganza. Clutching our purchases we enter the vibrant CJ's Indian Restaurant, which specialises in southern Indian cuisine known for its lightly spiced rice dishes and delicate flavours. We work our way through a thali, a combination plate of traditional southern Indian food. We finish lunch with sweet treats wrapped in silver paper, listening to upbeat Bollywood hits. Sue Wallace was hosted by Masala Meanders. Masala Meanders are conducted in Melbourne city and Dandenong. The tours include morning tea, a visit to an authentic Indian grocery market and a three-course lunch. The cost is $70. Phone Beacon Holidays on 1800 667 791, see beaconholidays.com.au.